GoodPress Pro is a fresh and responsive WordPress magazine theme from HappyThemes developer club. 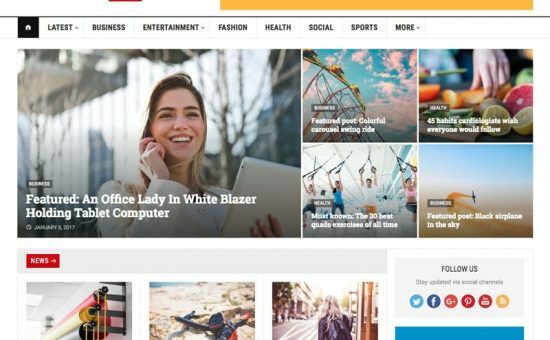 This theme is specially designed to use for magazine, news, newspaper, journalist, and publishing latest hot news about politics, technology or review-based websites. GoodPress Pro WordPress Theme can be used for any kind of online magazine websites. It is a responsive web design that supports to work on all latest modern browsers and devices like iPhone, iPad, Tablets, Windows phones, and desktop. GoodPress Pro WordPress Theme has built with all necessary features to create a wonderful online magazine site with Google AdSense ready! GoodPress Pro WordPress Theme has come with unlimited theme color options, Google fonts selection, sticky navigation menu, the homepage features content to display the latest news with images and many more. The homepage blocks have different sections to display the content by categories, such as 1 column type A and B, Homepage 2 and 3 columns block and etc. GoodPress Pro theme is coded by professional WordPress experts and clan code to load fast on all browsers with high-ranking possibilities of quality code. There is also live WordPress customizer, which will allow you to edit and customize the headers, post options, changes major settings of the website. Forum support and much more.